The Infinite® 200 PRO NanoQuant was the first microplate reader to be developed specifically for absorbance applications with small sample size. 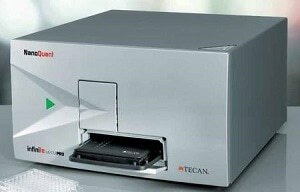 This sensitive plate reader meets highest spectrometer capabilities covering the UV to NIR spectral range and is available with Tecan’s Quad4 monochromators™ or with UV-stable filters, and can detect DNA concentrations as low as 1 ng/μl. This affordable plate reader represents a simplified version of the standard Infinite® 200 PRO multimode reader and is compatible with Tecan’s patented NanoQuant Plate™. The Infinite® 200 PRO NanoQuant is the ideal solution for a broad range of applications for measuring DNA- or RNA- quantification, for quality control and labeling efficiency. It delivers excellent sensitivity, multiplexing capability and high format flexibility including 6 – 384-well microplates, half-area plates as well as cuvettes and the NanoQuant Plate for low concentration and small sample size. In the unique NanoQuant Plate a special quartz optic for each of the 16 samples guarantees outstanding performance and a high rate of reproducibility. The plate offers quick and easy cleaning to minimize the risk of cross contamination. In addition after a working day the plate can be even cleaned in an ultra sonic water bath for additional efficient cleaning. The NanoQuant Plate is compatible with an eight-channel pipette to easy dispense the samples on the 16 positions of the tool. The latest i-control™ software includes new application-oriented features which enables more user comfort with the established methods by a minimum of user interventions, e.g. DNA or RNA quantification. Depending on the application needs, DNA or RNA samples can be measured either with the NanoQuant Plate with low sample volume of 2 µl to conserve most of your precious samples, or e.g. half-area well plates can be used with a volume of 20 µl without wasting any volume of the measured sample. The Infinite 200 PRO NanoQuant can be upgraded with all additional detection modes that are available with the standard Infinite 200 PRO as required.